Transform your skin with the Skin Republic Seaweed Hydrogel Face Sheet Mask, an anti-ageing sheet mask infused with a cocktail of powerful ingredients to promote a smoother-looking, youthfully radiant complexion. Delivering instant hydration, the sheet mask adheres comfortably to skin, enabling optimum absorption of ingredients for maximum efficacy. Mineral-rich, it harnesses the anti-ageing benefits of Seaweed, a component that works to restore lost elasticity and suppleness for a healthy, younger-looking visage. Supporting natural collagen, the supercharging sheet mask targets visible signs of ageing to inspire a luminous, smoother appearance. Also contains Chamomile Flower and Peony to soothe and minimise redness. Cleanse skin, remove mask from packaging. Remove thin tissue backing from mask and discard. 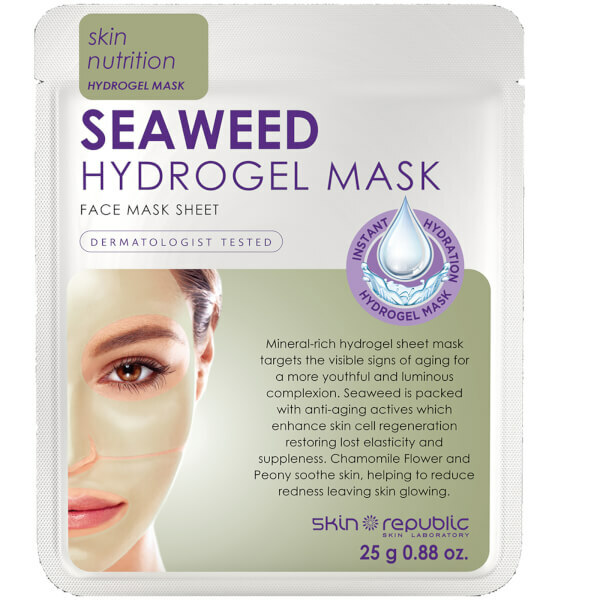 Place hydrogel mask on face with firm backing paper still in place. Position correctly and carefully remove firm backing paper. Press and smooth into contours. Relax for 30 minutes. Remove mask and pat excess serum into skin. Aqua/Water/Eau, Dipropylene Glycol, Glycerin, Cetyl Ethylhexanoate, Ceratonia Siliqua Gum, Chondrus Crispus Powder, Glyceryl Stearate, Butylene Glycol, Cellulose Gum, Paeonia Suffruticosa Root Extract, Centella Asiatica Extract, 1,2-Hexanediol, Sodium Polyacrylate, Hydrogenated Polydecene, Chamomilla Recutita (Matricaria) Flower Extract, Glyceryl Caprylate, Allantoin, Polysorbate 20, Gardenia Florida Fruit Extract, Adenosine, Ethylhexylglycerin, Dextrin, Trideceth-6, Theobroma Cacao (Cocoa) Extract, Acetyl Glucosamine, Undaria Pinnatifida Extract, Sodium Hyaluronate, Laminaria Japonica Extract, Disodium EDTA, Parfum/Fragrance.